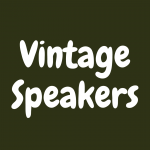 You are here: Home / Buying Record Players / The 5 Best Crosley Record Players with Built-in Speakers: Cheap, Portable Turntables! When I first started collecting records, I did a lot of research about what would be considered a good beginner turntable. I had about $150 to work with, but I knew I needed to spend somewhere under that to ensure that I could grab a couple records to play on the turntable. The more I looked, the more I saw the name Crosley, which to me was a sign that a lot of people own and love this brand. The fact of the matter is that Crosley is the most divisive name in vinyl today, garnishing endless criticism from seasoned record collecting veterans and constant flack for a number of aspects of their specifications and abilities as record players. There’s no denying the popularity of Crosley turntables in today’s vinyl resurgence, but just as sure as the brand has been central to millenials picking up turntables for the first time, so has the criticism behind the company’s ability to produce quality technology. The popularity versus quality debate surrounding Crosley can be confusing: how can something that is so popular be so negatively regarded by the people that supposedly know best? Well, that’s what we’re going to breakdown today, especially as I provide you with my list of the best Crosley record players with built-in speakers. And, to better help you determine the right record player for you, please take a look at the interactive table below. Well, that’s the thing. The different coalitions within the vinyl community have very different interests and points of concern. For someone looking for build-in speakers, portability, and a good deal, Crosley is hard to beat. 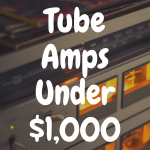 Fans of vinyl that have been around the block and have moved to spending more money on their setups are exposing themselves to a higher level of quality, and therefore, different concerns. Things like tonearm weight, pressure, and stylus quality don’t mean as much to someone starting a record collection, nor does that mean that those things have to be kept in mind if you want to play and buy vinyl records. The fact of the matter is, like most hobbies or interests, you should experience vinyl and turntables your way, meaning that if you’re concerned with a low price tag while maintaining quality and accessibility, Crosley is a great place to look. I started my turntable experience with a Crosley table, and I still have it to this day. 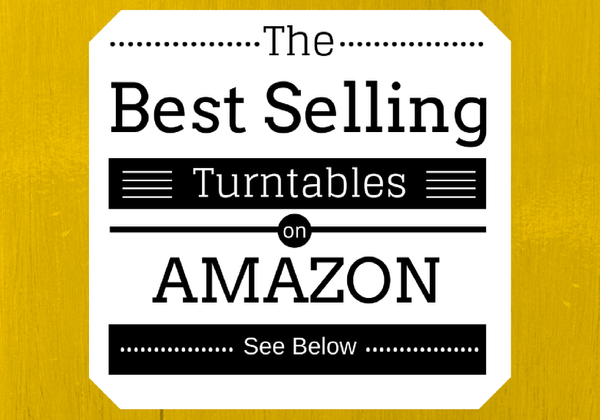 Below, please take a moment to view some of the best selling record players on Amazon, and then see how well some of them stack up to the Crosley turntables we’ll discuss in this article. Let’s begin this list with arguably the most popular Crosley of them all—the Crosley Cruiser. The Crosley Cruiser Portable Turntable is probably the most iconic table that Crosley is developing today. The Cruiser’s built-in speakers are encased within a suitcase-style shell, exemplifying its portability and compact design. For many, the Cruiser serves as their first turntable, leading to a deeper love and appreciation for turntables and vinyl records. 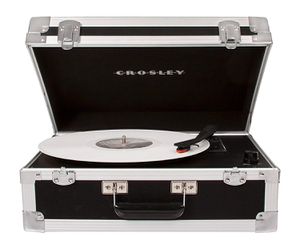 The Crosley Cruiser itself is vinyl-wrapped to give it a great texture and increased durability. The belt-drive design of the table is typical for most belt-driven turntables, making it a great choice for those just getting started. The tone arm of the Cruiser is manual, meaning you’ll have to place the needle on and off your records by hand, but to be honest, it’s not like that’s a difficult feat to accomplish. he Cruiser has dual stereo speakers, ensuring a high quality listening experience despite its compact design. The turntable itself doesn’t get terribly loud before sounding as if it’s being pushed to its limits, but it does work great for an office or bedroom. As mentioned, a major pro to the Cruiser model is its portability. Suitcase-style turntables get their name from literally being able to be contained in a suitcase-style casing, handle and all. If you’re taking your new Crosley to a friend’s place, you can literally hold everything but the AC adapter that powers the table in a light, compact manner thanks to its design. If you plan on only listening alone, and you’re worried about disturbing others, a headphone jack allows for a more personal listening experience, and if you’re wanting to listen to something you don’t have on vinyl, you can play sound from external devices by plugging them in directly to the Cruiser. Verdict: The Crosley Cruiser plays at three speeds: 33 ⅓, 45, and 78 RPM. Coupled with the ability to plug in a phone or MP3 player, this table does it all, and in a compact, concise manner. The Cruiser is a great place to start if you’re just diving into the world of vinyl. For someone looking for the Cruiser’s portability and the Player’s design, a wonderful middle ground exists in the Spinnerette. While this turntable sports the portable suitcase-style design, it’s much more retro-looking, with an entire right portion of the cabinet designed to look like the head of a speaker. When closed, this Crosley favorite looks like any other portable table, but if you open it up and spin your favorite record on it, you’ll be blown away at the punch that this table packs. The diamond stylus needle and belt-drive mechanism make this table reliable and impressive given its size. The turntable is made out of acrylonitrile butadiene styrene, better known as a thermoplastic polymer, meaning its meant to resist heat in order to ensure the hardware inside stays safe while you’re on the go. The Spinnerette also features an aluminum grill that is equal parts practical and attractive. The turntable also offers the similar Crosley specs, such as three speed playback, dynamic stereo speakers, and plug-and-play capabilities. An added bonus to the Spinnerette is the ability to rip music from a record to your laptop or computer. A USB drive allows for storage devices to be inserted and pull audio, which can then be saved as an MP3 for playback on players and phones. The ability to go digital with your vinyl records means even if you don’t feel like bringing the turntable somewhere, your music can go where you go. 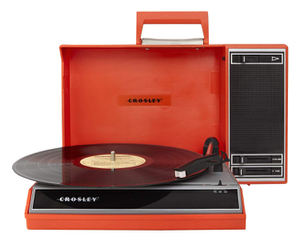 Verdict: The Crosley Spinnerette is retro and modern at the same time. Its throwback design and MP3 ripping capabilities make it a great option for people looking to digitize their record collection while also having a great manner in which to listen to their collection the old-fashion way. When turntables began popping back up in vogue, the Musician Entertainment Center (or Crosley CR42C)) was a popular set-up, seeing as it embodied Crosley’s great built-in speaker design as well as a classic style that was reminiscent of old radio cabinets. Luckily, Crosley has continued to improve on the MEC, and that means more options for listening than ever. The MEC is an all wood-style turntable. You may not be able to pick this up by a handle and take it places, but you won’t want it leaving your house because this stylish piece looks great as part of a living room configuration. I always suggest people that like early to mid century design should pick this table up. Three speed listening options as well as a belt-drive mechanism means you can listen to records, but the MEC doesn’t stop there. Yes, there’s a radio with AM and FM capabilities. Yes, you can plug in a phone or MP3. What separates the MEC is the ability to play cassettes and CDs. Function select buttons that fit in nicely with the MEC’s design allow you to seamlessly switch from a tape to the radio, and from your phone to a record. The MEC works for you, and it’s great having so many options at your disposal. Recently, the MEC also added bluetooth capabilities, meaning cords are no longer a necessity for your phone. With its fuller cabinet and body, the MEC has a great sound to it, and fills up a room nicely. Verdict: One of my favorite Crosley turntables, the Musician Entertainment Center allows for endless ways to play music and media. Records from all times, as well as CDs and cassettes, have their place in this table. And all for under $200! If you’ve been thinking throughout this article that you’re in need of something with a bit more of a punch, the Crosley Bound is the table for you. A suitcase-style design is great here, but it’s much larger than the Cruiser. The larger body on the Bound means that concerns about volume are no longer a factor. The Bound isn’t necessarily hard to carry despite its size, and the handle mechanism allows for pick-up-and-go listening, much like the portable Cruiser. Other specs of the Bound are similar to the Cruiser. Like Crosley players largely are, the Bound is designed to play three speeds, support external speakers, and an added bonus, accept a bluetooth connection as well as play through an auxiliary cord. The difference here though, again, is the sound. The volume of the Bound, as well as its fuller cabinet size, makes this a more serious table than the Cruiser. 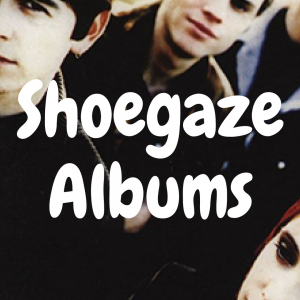 If you’re looking to spin records for friends in a larger space, this is a good option. Verdict: Think of the Crosley Bound as the Crusier’s bigger, badder, louder brother. The Bound is meant for people looking to kick out the jams, whether they’re on vinyl or bluetooth. Crosley is a brand I tend to defend endlessly. 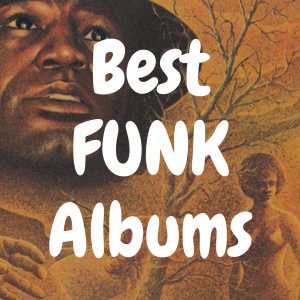 From this list, you can see all they have to offer, and its clear to see that your listening goals for a turntable are probably found in one of these tables. 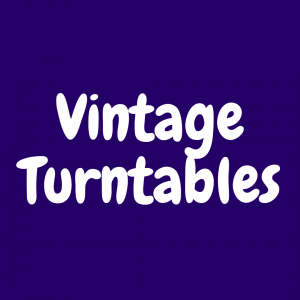 These are my favorite when someone is looking for a beginner record player or if they just want to try something new that does a lot for a little. Happy spinning! 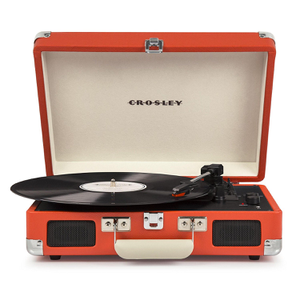 The Crosley Player is a turntable with style in mind. The large base to the system makes it look like a piece of supporting furniture fit for any modern home or apartment. The stylistic design of the Player is deliberate and sleek, meaning that you’ll enjoy looking at this Crosley just as much as you will listening to records on it. 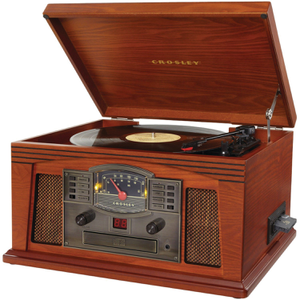 A review of the Crosley Player needs to start with its design. The table itself is silver on top and in front, with a wood-colored paneling on the side reminiscent of turntable rigs in the 1960s and 1970s. Think Don Draper from Mad Men kicking his feet up to “Tomorrow Never Knows” level class and sophistication. A diamond needle stylus is an upgrade from the Cruiser’s specs, as well as the Player’s integration of clear dust cover that can be removed if you wished. The Player has an RCA output for external speakers, as well as input options for plug-and-play with MP3s and phones. Three speed record playback is available as well, with the added bonus of an AM/FM radio that can be tuned from the display on the front of the cabinet. Verdict: Dynamic stereo speakers and a larger base make the Crosley Player a turntable you won’t need to upgrade any time soon. For $100, you get a great turntable and a statement piece for your living room or den. 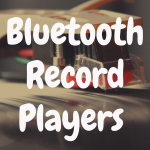 What’s the Best Record Player with Bluetooth?